How do I know if I need the more traditional full service interior design or if an interior redesign is right for my home? If you're happy with the furnishings you currently own and want to utilize them as much as possible in your redesigned room, or feel that you can implement a design plan on your own even if you will be making a lot of major new purchases, then a one day decorating consultation is probably the cost-effective avenue for you. In addition to arranging the room to best advantage, you will receive a detailed design plan, suggesting ways to further enhance the room, which you can implement at your own pace as your budget allows. On the other hand, if you're too busy to work on a collaborative interior redesign or would just prefer that a professional do it all for you, then our full service interior design and decorating is most likely the better choice right from the start.. If you're unsure about what will best serve your decorating needs, call us at 917-754-6535 and we'll be happy to help you decide. What if I later decide that I want help implementing my design plan ? Because our one day decorating clients receive the same type of extensive professional "designer's" plan that we would create as a blueprint for ourselves when handling a full service client - including full color schemes, window treatment designs and worksheets, etc.- you never have to worry that you made the wrong choice. If you later opt for more help with implementation of your written plan or any part of it, we already have our professional plan in hand and are available to you for follow-up shopping services and all other aspects of plan implementation as needed. We waive the minimum two-hour requirement for decorator shopping and other implementation services when we are implementing one of our own room plans. And don't forget! Unlike any other one day redesign service in the market, Area Aesthetics' one day decorating service includes ongoing follow up by phone and email at no additional charge until your plan is completed. How much are your flat-rates for one day decorating? Our flat-rates are based on the size of the room so you will know exactly what the cost will be before we start. We stay abreast of the market and know that our interior redesign services are one of the best design values to be found anywhere. In fact, we invite you to call our competitors and compare! We understand that choosing a professional to work with you in your home or business is a very personal decision and that you have put a lot of time and energy into finding the right design professional for your project. For this reason, Peggy Berk personally handles all Area Aesthetics clients. Junior staff is never dispatched to a job alone and there are no hidden up-charges for the involvement of Area Aesthetics' principal designer. Your project deserves the best and Area Aesthetics is committed to delivering nothing less. What if I later decide that I want help implementing my design plan? How long does a one day room makeover take? Can everything be rearranged on the day of my interior redesign? Can you do one-day decorating in an empty room? 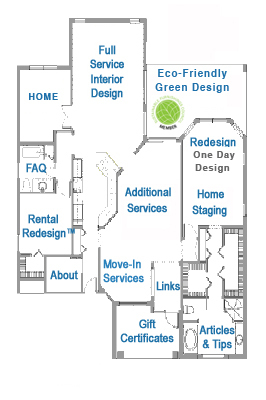 Do I need to be home during the interior redesign? I'm moving. Should I call you after I am settled, or before I unpack? My husband and I both want color in our home, but we can't seem agree on the colors we'd like. Can you help? My contractor has asked us to select finishes for our bathroom and kitchen. Can you help? Do you work in period homes? How can I find out more about your High Point Excursions? I see that you are a certified interior refiner, but did not see you on that group's directory. Why? Questions about interior design, interior redesign or any of our decorating and design services? Or submit them here and we'll add them to our FAQ! This is the ideal, but, sometimes there are items that can't or shouldn't be moved. For example, you might find yourself without cable TV until you can arrange for a service call, if we move your media unit. Items such as grand and baby grand pianos should always be moved by a professional. Our one day decorating service is a collaborative process. Because we include a full lifestyle consultation and space planning and will be creating a detailed design plan including a range of color selections and finishes for your room, it is important that you play a significant role in its development. These are important choices. Tiles, flooring, countertops and other finishes you are considering for your home are not just important elements in your interior design, but, because they become a permanent part of your home's style and color scheme, can also significantly impact the resale value of your home down the road. Area Aesthetics offers hourly selection services to help guide you in the selection of finishes for the kitchen, bath and every other room in your home. We'll also coordinate paint and other colors in the room that will bring it all together in a cohesive color scheme. We work in all styles and period homes are among our favorites. Whether you want to embrace and showcase the authenticity, or are struggling to leave the past behind, Area Aesthetics can help you achieve your vision. 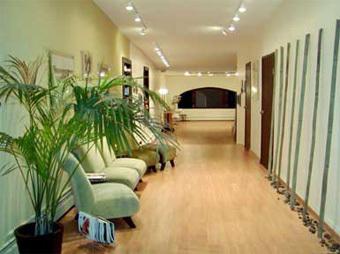 Contact interior decorator and redesigner Peggy Berk at 917-754-6535 or by email at pberk@areaaesthetics.com. As Seen in Interior Redesign Directory! About Hiring a One-Day Decorator"